You can get whole trees in the mail. Can you imagine a more exciting package? Well maybe a million dollar check but realistically trees are probably the coolest thing getting delivered to this house. Until recently I had never even heard of buying bare root plants. For those of you like me it basically means that the plant or tree has no dirt around its roots and is in a state of dormancy. Why would you want to buy a tree like that? I know it sounds weird but it’s actually pretty awesome. Yes, walking around your local nursery can be fun and you should totally support them too! However often times I’ve found bare root trees online (plus shipping) that are still half the price of those at my local nursery. Larger companies that sell online also have a much bigger selection. They can be great if you’re looking for something very specific or something a little on the exotic side like kiwi berries, honey berries, or hop vines. Who knew two trees and a grape vine could fit in such a tiny box! Twice this spring we ordered online. We have purchased a Reliance Peach, a Jonathan Red Apple, a Concord Seedless Grape, 6 Himbotop Primocane Raspberries, and 25 Tribute Strawberries from a company called Starkbros. Even though they came with no soil they all did great. An important thing to note in ordering plants online is that they are coming from somewhere else so they may not have the best varieties to suit your climate. You need to do some research before making your purchases. We got lucky as Starkbros is in northern Illinois and does carry varieties perfect for our part of New Hampshire. They also have a zone check feature where you enter your zip code and it will display a check mark next to all the plants and trees appropriate for your hardiness zone. The roots of our new peach tree. You should also take into consideration how much space you have for trees. You can purchase most fruit tree varieties in dwarf, semi-Dwarf, and standard sizes (another great thing about ordering online). The dwarf and semi-dwarf species not only take up less space but are easier to maintain and harvest from. However they usually have shorter lifespans and produce less. Before your plants or trees arrive you should select a location to plant them. Think about how much light your plant needs and what kind of space it needs once it is a mature size. You will also need to make sure the soil in the area you choose is fertile, well drained, and has a pH that your plant likes. You should find details on your species preferred environment on the website you’re ordering from. I highly recommend doing the prep (adding compost, checking pH, etc.) before your plants arrive. No one enjoys a mad dash to get plants in the ground. Trust me I’ve done it. When your plants/trees do finally arrive they will most likely come with an instruction booklet but I’ll give you some idea of what to expect. To get your plant ready for transplant you should soak its roots in water and give it a good drink for about one hour before planting but no longer than six hours. Then you can go ahead and plant. You want to bury it just above the roots in your beautiful, fertile, prepared soil. Our peach tree just after planting. Trees and plants aren’t a one and done thing. Don’t forget they’ll need continued care and watering. Our strawberries are watered whenever our vegetable garden is and when we get into really dry weather we water our trees about once a week. They’ll also need other yearly care but that’s a whole other post. Good luck with your spring purchases! **Update** We left our little orchard behind when we left for West Virginia but we’re planning an even bigger orchard for our new farm! 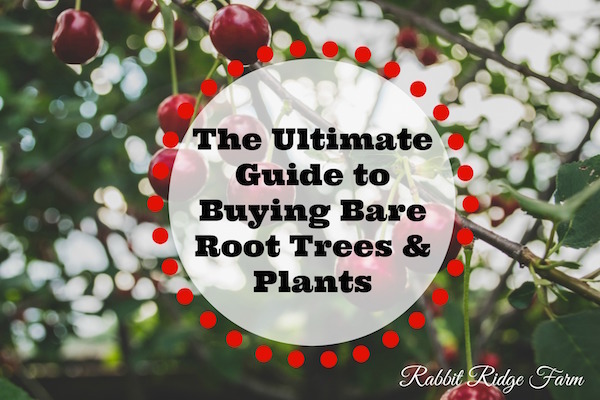 6 Responses to "The Ultimate Guide to Buying Bare Root Trees and Plants"
I would love to have some fruit trees! Don’t know what new stuff we’ll plant this year! Visiting from #goinggreenlinky. I want to invite you to visit a linkup I cohost every Sunday at http://www.pursueyourproject.com. It opens at noon EST. Hope you can come! I’ve just planted out some bare rooted blackcurrants and Jostaberries so I’m hoping for plenty of fruitful harvests over the coming year. You say about giving them a drink before you plant them – this is really important as they won’t survive if those all important roots dry out . We planted out a whole boundary with bare rooted hedge plans when we arrived in France and because it was on a dry, windy day we soaked the roots and then kept them covered right up to when we were ready to plant them in the soil. 10 years on we have a wonderful back hedge that acts as a wind break and is a fabulous habitat for birds. 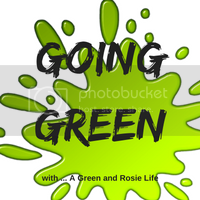 Thanks for linking up with #GoingGreen and I hope to see you on the next one on March 1st. I’ve never even tried blackcurrants or jostaberries but I definitely want to! I hope you get an excellent harvest. Hedges are awesome, we’re hoping to plant one as a sort of living fence on our property. We got two fruit trees by mail order for our allotment. We took great care in planting them and then four months later we got offered a better plot so he moved them. They took well but our neighbour had neglected his plot and weeds grew up. He then came along cut the weeds down and chopped the top off our plum tree with it! Oh no! We never did see fruit from any of our trees before moving but it’s actually part of my dad’s property and he takes good care of them. He sent me pictures of peaches he got this summer that made me so jealous. I guess we’re in the same boat we’ll be starting a new home orchard this year.